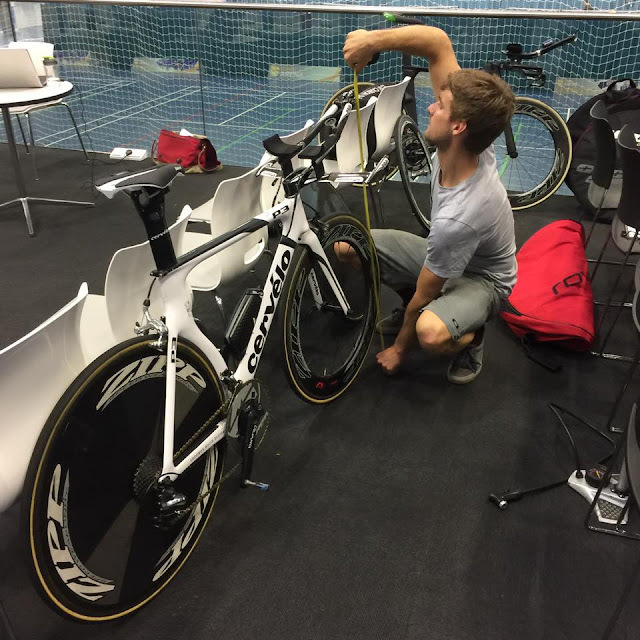 On getting aero, breaking records and winning races | theraceforthecafe.com . 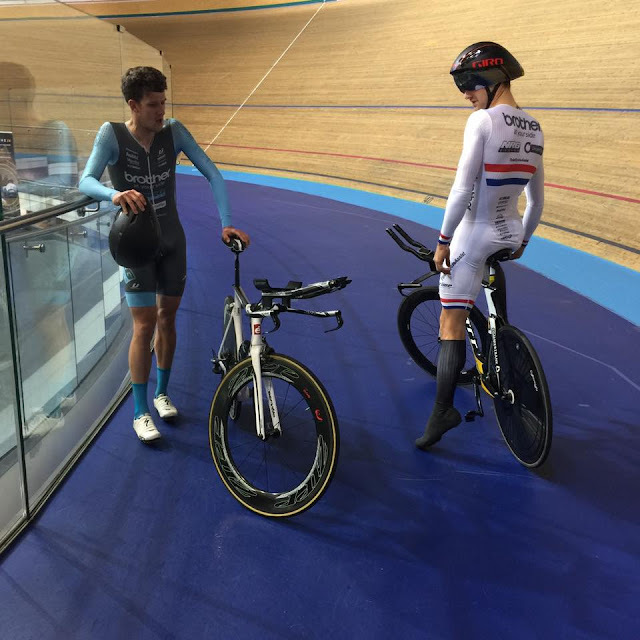 Last Monday I was at Derby Arena where Brother/NRG/Driver Plan BND were doing a session of testing conducted by team rider Dan Bigham of Wattshop Shopforwatts The aim of the two hour session was to optimise aerodynamic efficiency of the riders time trial set ups. Some of the team were making comparisons betwen different types of kit and others were making adjustments to position. However, the intention of all of the riders was to lower their CdA number. Here is the techy bit - CdA is the aerodynamic dragcoefficient multipled by your frontal area. Apparently a typical road bike riders set up would give a CdA of between 0.25 and 0.35. A well set up long course triathlete would have a number between 0.21 and 0.26. 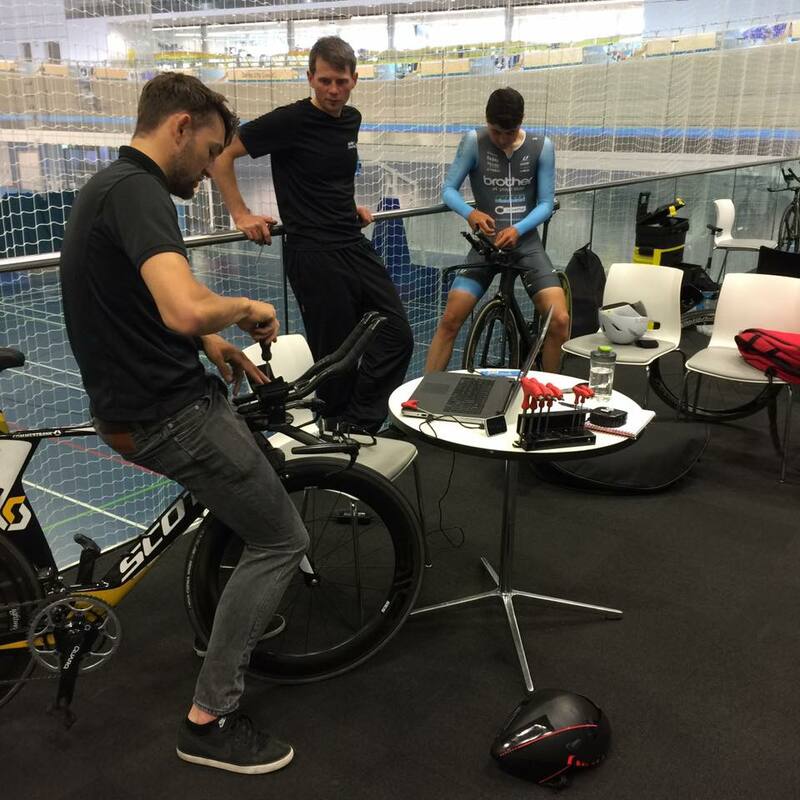 Top time trialists are aiming for a CdA of 0.18 to 0.20. Crucially a rider's CdA is also dependent on his ability to hold a consistent position. This is referred to as the coefficient of variance, anything below 3% is good but to be very good it needs to be below 1.5% but, this requires really good positional stability which is not easy to do. Aero watts is the aerodynamic drag power required to hold a given speed, ignoring climbing, rolling resistance and drivetrain losses. Dan Bigham from Wattshop Shopforwatts takes some initial measurements before the testing starts. Dan maintains that it is not sensible to spend hundreds or thousands of pounds on equipment that will save very few watts. The first things to do if you want to go faster for the same amount of power is to improve your aerodynamics, your rolling resistance and your weight. These are all variables within your control that are relatively cheap to improve. Various bar lengths and angles were tested throughout the day. 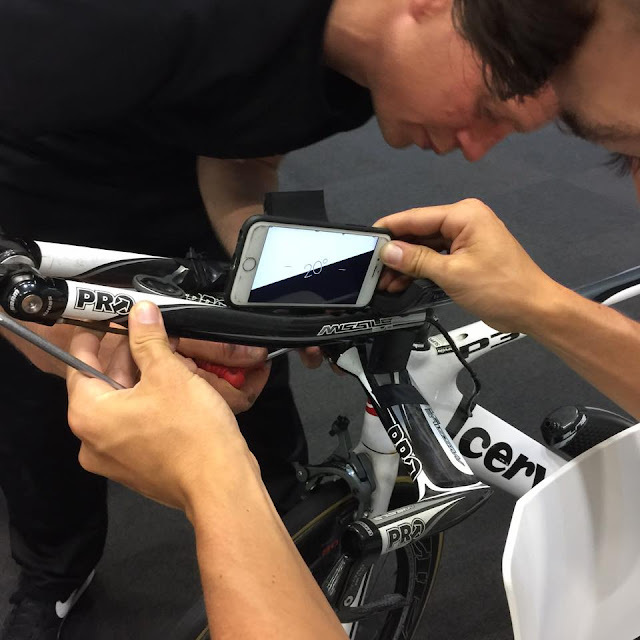 Above Si Wilson and Jake Tipper make adjustments to Jack Rees's handlebar set up using an Iphone. Who knew there was a spirit level on their Iphone? - not me. (second page of the compass, have a look when you have finished reading this) One of the things that really stood out on the day was the team work, everone mucked in, quickly making the required changes to each others bikes so that the next test could be done without wasting any track time. One of the strengths of the Brother/NRG/DriverPlan is the expertise within the team. 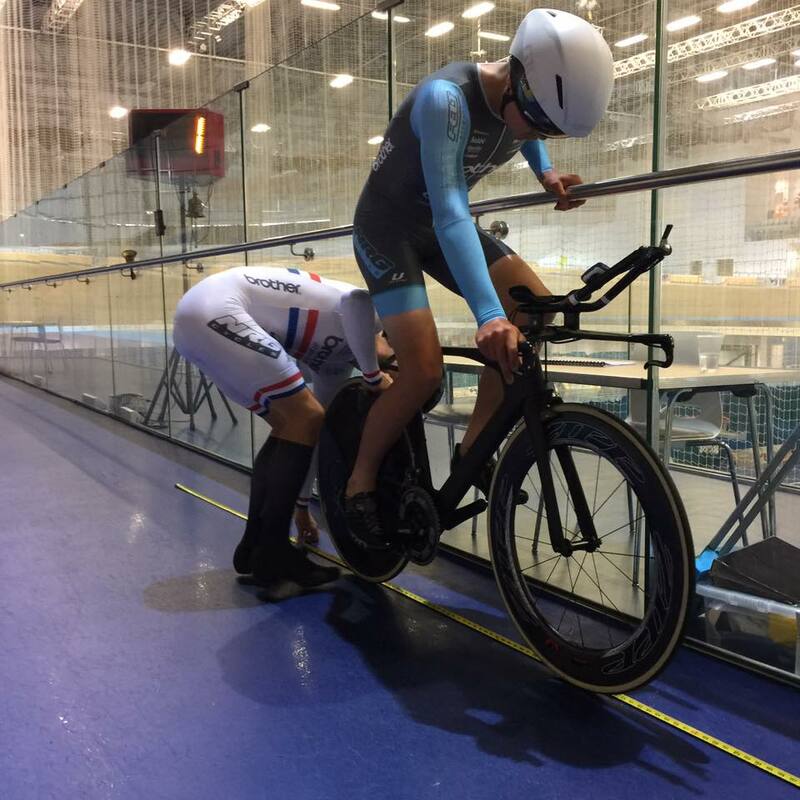 Jake Tipper is not only the team's sprint specialist but he is also a high performance cycling coach JT Performance Coaching. Above Jake records the details of Jacks bike before his first set of laps. All the laps were done in the same gear, with the same wheels and at the same tyre pressure. Two laps to get up to speed and then eight laps at a consistent power and crucially in a consistent position. Jack and Dan have a quick de-brief after Jack's first test. Jack was primarily interested in refining his position and after an initial baseline test various combinations were tried. Different bar lengths and angles, different hand widths and different head positions. 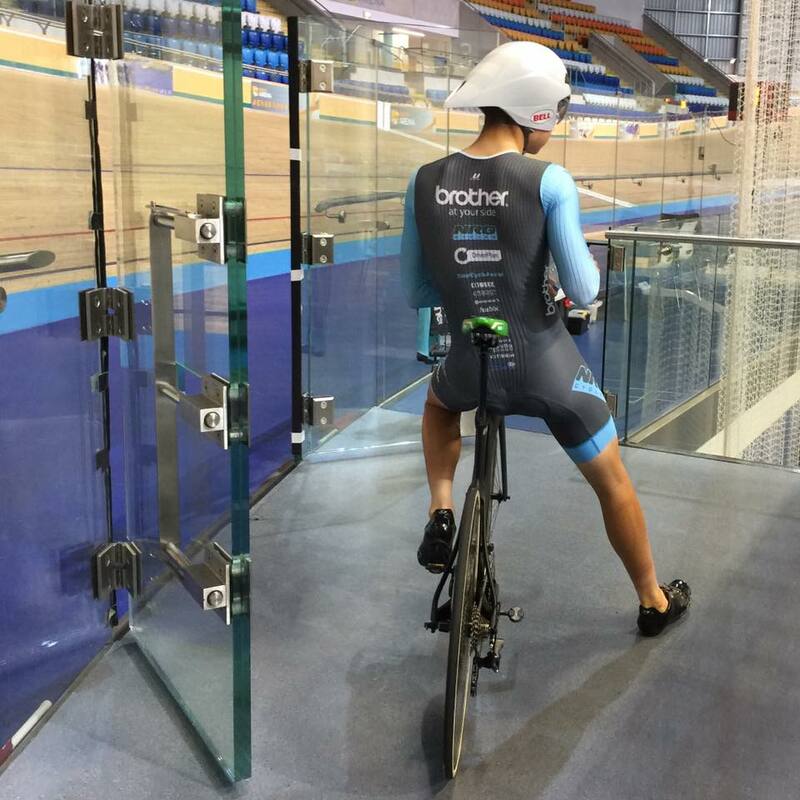 Dan was not only testing the other riders he was also using the track time to fine tune his own already ridiculously aero position. 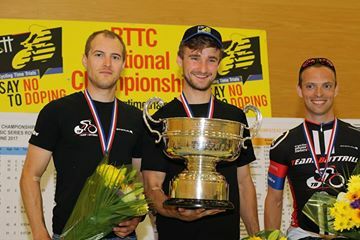 Even with three National Track Championship wins ( four by the end of this blog post!) Dan knows that there are still gains to be had and he knows how to achieve them. 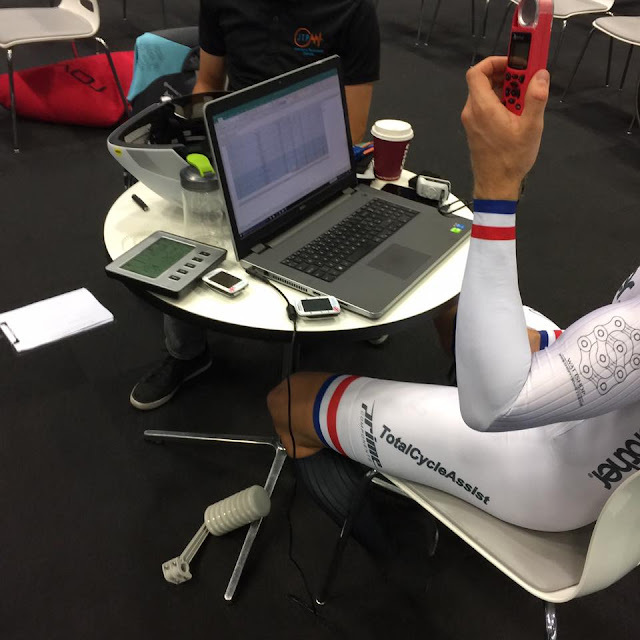 Its all about effeciency for Dan on and off the bike - not a second of track time was wasted, here he quickly inputs ride data before going back out on the track for his next test. While Dan was testing Jake, Si and Charlie Tanfield make bar position adjustments. Charlie is a national Champion and already has a really effective position but like Dan he is is still in search of improvements. On Monday he was making comparisons between different helmets, gloves and different shoe and sock combinations. Each tiny improvement of a few watts brings down the CdA. So what was fastest comination is what you want to know right? For Jack a medium length bar set at 19 degrees with a narrow arm postion worked best. The biggest saving though was related to his head position - big watts to be saved there, the old coefficient of variance mentioned above. To get those watts the rider has to assume a 'shrug' position and maintain it, doesn't sound that hard but it is. 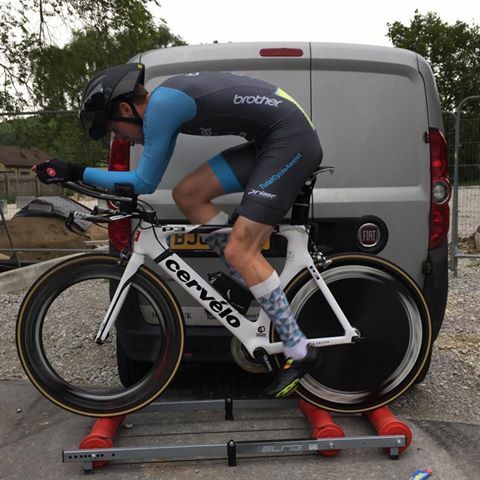 After the testing on Monday the five riders were competing at Newport near Hull in a 10 mile time trial. 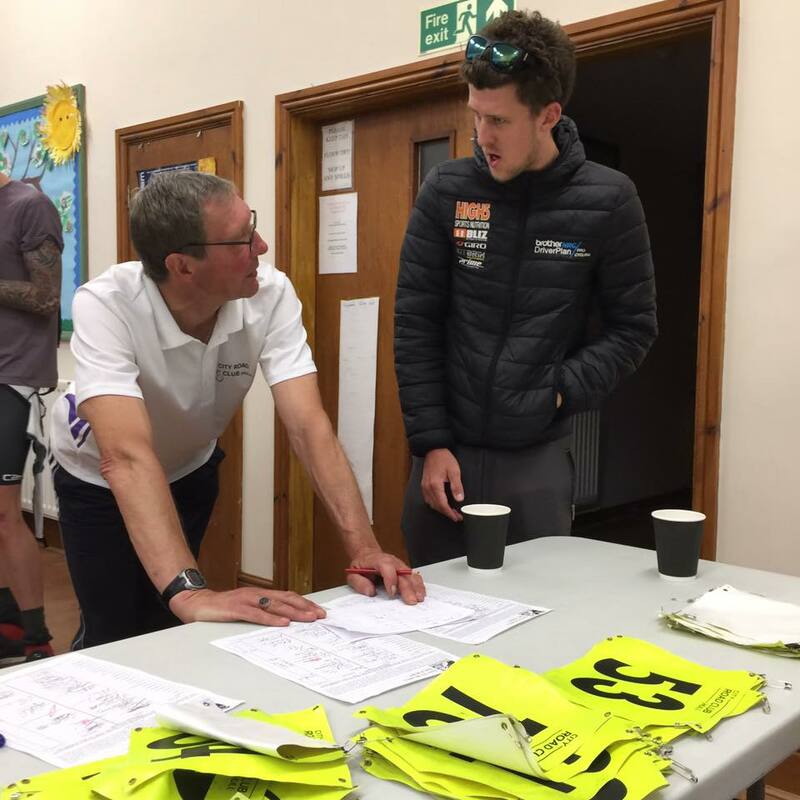 The open event was promoted by the City Road Club (Hull) on the V718 course. 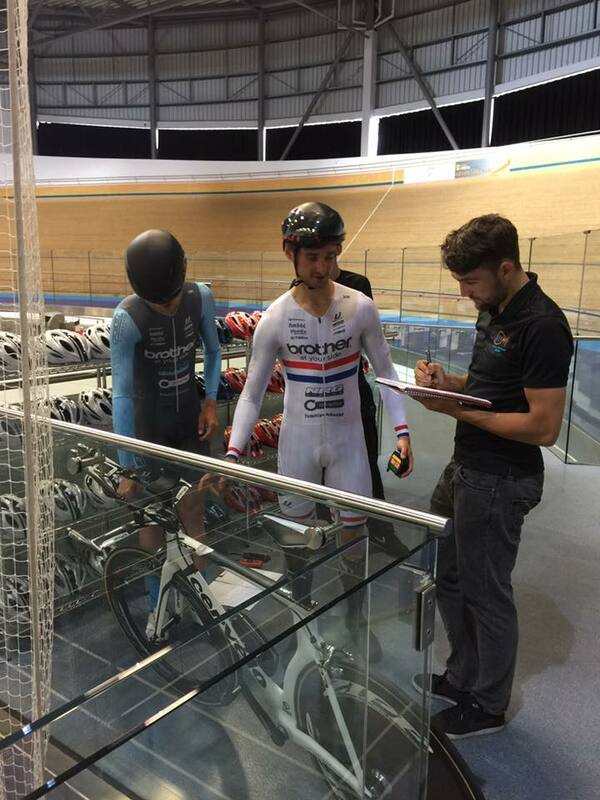 The objective on the night was to break the British three man team competition record held by the Drag2Zero Team. Wednesday was very windy and it looked like the conditions would be far from perfect although the forecast was for the wind to ease. By the time the team got to Newport the wind had dropped considerably and conditions had improved but were still regarded as being less than ideal. Despite the conditions the team broke the competition record not once but three times on the night with Jacob Tipper posting an 18.40 and Jack taking 1 minute 17 seconds of his personal best with a 19.14. The best combined time for three riders from the team was 53:15 (an average speed of 33.8 mph from a standing start). Dan Bigham -17.24, Charlie Tanfield -17:46 and Si Wilson -18.05. Brother/NRG/DriverPlan Team Boss Jack hears the news from race organiser Mike Philipson that the team have broken the British record by an incredible margin of 2 minutes and 6 seonds. Here is Dan in full flight (captured by Craig Zad photography) on his way to a 17min 24 second ten miles - the third fastest time ever recorded. On Friday and Saturday the teams focus switched to the road with a four man team lining up for the Holme Valley Wheelers 2 day. Dan and Charlie were joined by Will Brown and Alex Luhrs. The team won all 3 stages with Dan taking the win in the opening TT and also taking the win in the first road stage. Not to be outdone Charlie won stage 3 by a 4 minute margin with a fantastic solo effort and in doing so took the overall win. Charlie takes the 3rd stage and the overall with Dan 2nd. 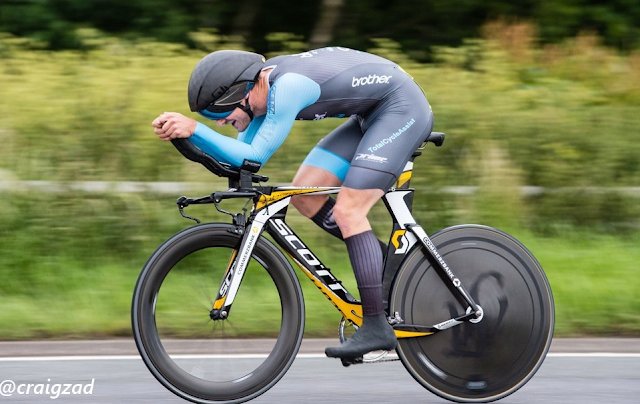 To round of the week Dan's tremendous form continued as he took the win by 7 seconds at the RTTC Circuit time trial championships at Cranfield. His fourth National Championship win of 2017 ! 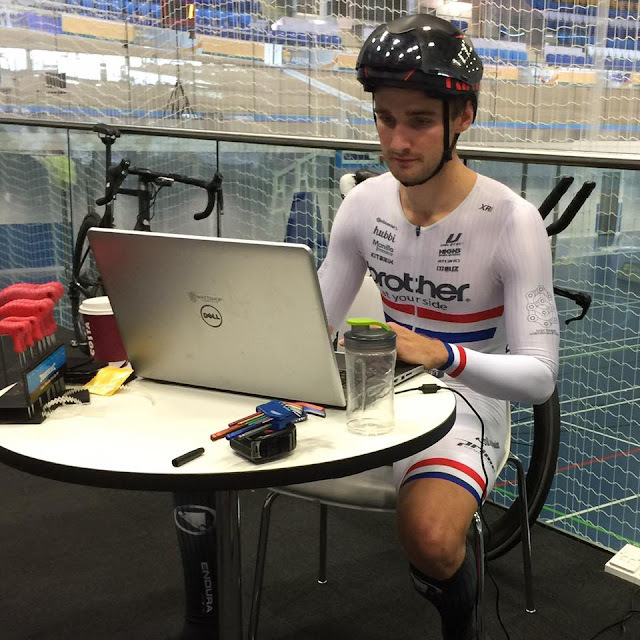 Quite a week for Brother/NRG/DriverPlan NEProCycling - getting aero seems to work. The 2017 United States Open Championship will be the 117th U.S. Open, scheduled to be played June 15–18 at Erin Hills in Erin, Wisconsin, northwest of Milwaukee. This is the first U.S. Open in Wisconsin, but the state's fifth major championship.